My fascination with the human body — how it moves and functions – began while studying anatomy and physiology to obtain my undergraduate degree in Nutrition. 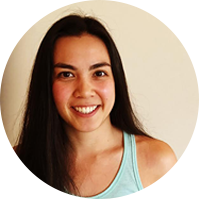 I next completed a 200-hour Yoga Teacher Training program which expanded my passion for helping others live healthy and active lives, and eventually led me to pursue becoming a licensed massage therapist. Through massage and yoga I get to help others learn about their own anatomy and physiology, alignment, and structure, helping them to release stress and tension and leaving them feeling balanced and at ease. At East West College I developed my unique style of massage which includes a combination of relaxing Swedish, deep tissue, and myofascial release techniques. I’ve also studied Thai massage – an ancient healing system involving deep compressions, stretches, and gentle passive movements, to increase range of motion, loosen tight muscles, and improve circulation. I encourage clients to try Thai massage because it can leave you feeling invigorated or deeply relaxed, can help alleviate pain, and generally leaves one with an overall sense of wellbeing. My approach to massage is to bring the body back into optimal shape to prevent injuries and illness so clients can enjoy life to its fullest. As an avid rock climber and yoga practitioner I know and appreciate firsthand the importance to having a healthy body in order to practice and enjoy my favorite activities. When I’m not engaged in massage or teaching yoga, I’m likely climbing at Smith Rock, Leavenworth, or at the Circuit Bouldering gym. Some of my personal hobbies are cooking, drawing, and reading in my spare time.